Your own character building kids' magazine and audio adventure right now! Characters: The Old Compass Adventures. A highly entertaining character education audio adventure on internet safety. Over 25 minutes of attention grabbing entertainment that will retain your students’ attention while you relax. Includes "The Character Detective" activity sheets that clearly explain to parents what you’ve been teaching and get them involved. Once again, it’s all done for you. The PDF magazine has articles, puzzles and interactive pages that will keep your children busy while they listen to the audio story. Reinforce the concepts learned in the audio drama. 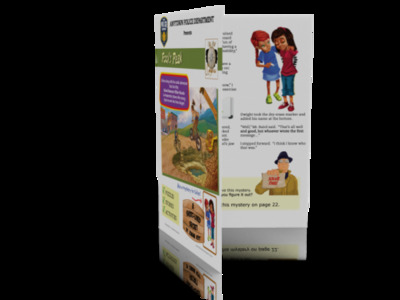 Download the audio adventure MP3s, the PDF magazine and the activity sheets right now. Transfer the adventures onto the classroom portable MP3 player or play it on the school computer. Suitable for public school and religious schools. Respectful of both conservative and liberal point of views. Help your students learn internet safety without a religious undercurrent. My audio adventures will keep a healthy level of suspense and mild fiction without crossing into “darkness” or "fearfulness". Eco-friendly! Print only the pages you want. Designed for home printing in mind, keeping a good balance of color and yet rendering captivating black and white printing as well. Summary of the story "Fool's Peak"
In the story Fool’s Peak, we meet a nine year old boy named Ryan, who likes internet gaming. Ryan started chatting with an online gaming “Guru” and eventually agree to meet him in person in order to loan Ryan a very cool sword to wear at a cosplay convention. Meanwhile, the school resource officer, Ricardo, has been warned that a bad guy has been making contact with a student from one of his schools. Also, Ryan’s parents get suspicious when Ryan says he wants his dad to meet a new friend after the convention. School Resource Officer Ricardo talks to one of Ryan’s friends. 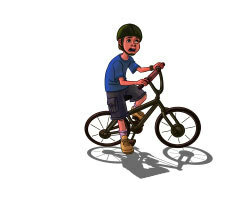 He learns where Ryan has agreed to meet the stranger, and takes off on a borrowed bicycle to follow him. Officer Ricardo soon finds out the brakes on the bike don’t work, and he ends up trying to jump Fool`s Peak in order to save Ryan. There are unique an important life lessons packed in these resources. You'll be teaching kids about internet safety, obedience, caring. All of this while entertaining! Absolutely Risk Free To You! I'm so confident that you'll be completely satisfied; your purchase is backed by my 30-day money-back guarantee. If for any reason, you have spent time with kids using my products and you don't feel I have met your expectations, I'll gladly refund your entire purchase.